The likes of Jinjer, Butcher Babies, New Year’s Day and Infected Rain have been flying the flag for female fronted Metal bands globally over the last few years, while each offering their own sound within their tagged styling. Now it’s the turn of Feelament, a Grove Metal quartet from Moscow Russia, to put their hat in the ring and join the rising number of bands putting a spotlight on Metal right now. “Hate Delivery” begins with a 92 second introduction piece of quirky robotics sounds, distorted voices along something of a science fiction theme before opening track proper “Power and Glory” kicks in full throttle. Frontwoman Masha Balyasova demonstrates some incredible vocal range mixing some savage growls with some gutteral uncleans that flow into some tastefully sung cleans. But that rather using the vocal changes upon usual structural lines to separate for example verse and chorus, she mixes them up within the lines of the verses. “What’s The Price” continues that vocal pattern styling over some Pantera styled riffage from Tim Jabbarov who shows his skills with some decent solo work in amongst a barrage of shredding riffs. Balyasova might not quite reach Lauren Hart of Once Human‘s bowl clenching lows but she does deliver some vicious banshee wails on this one. The album title track “Hate Delivery” has a quirky intro soon replaced by a buried siren and a rhythm section work out for bassist Yaroslav Bugakov and kit woman Nikita Ladygin. Mixing up the guitars with hints of DJentisms creates another dimension in the mix while the atmospheric of the song itself delivers a far better song than the intro suggests you’re in for. “Trapped” proves that Balyasova can match Carla Harvey of Butcher Babies for that low growl while the use of a twin vocal layering to have a higher pitched tone in front of it in places gives the impression that a decent backing vocalist is in the band. The clean vocal melodic passage is achingly beautiful and the pronunciation issue makes it obvious that the bands first language is not English. That is what we want to hear, we don’t want generic American English vocals from every band. “Obsessed” has some driven chugging riffs with hints at progressive Metalcore in the dark atmospheric. Lyrically about mental health it’s a real thought provoker after the music has faded. Single “Great Tragedy” is the longest cut on the album at 5 minutes 22 seconds and shows that the band have the musicianship to create something that is captivating without a soft middle. Blast beats and stuccato riffs are that the songs heart using a second guitar track to add squeals and pulls before a face melting solo. One of the highlights of the track is a vocal passage where the cleans sit higher in the mix as the uncleans tear through the middle like a knife through butter. “Incurable Disease” brings a final relentless ruthless tune to the fore and confirms hat Feelament are all about quality rather than quantity. Again, the variety in the vocals is phenomenal and carrying off this amount of range live must be a serious vocal work out! There is a menacing groove to this one that is highlighted by some light lead work that builds a sense of tension throughout. The addition of buried synths on the track helps take off the load that a second guitarist would give them and adds an extra depth. “Outro” is a stripped down tune of primative programmed beats with some almost inaudible speech samples over crackling radio transmissions and synths that may serve at a live intro tape at some point in the future. 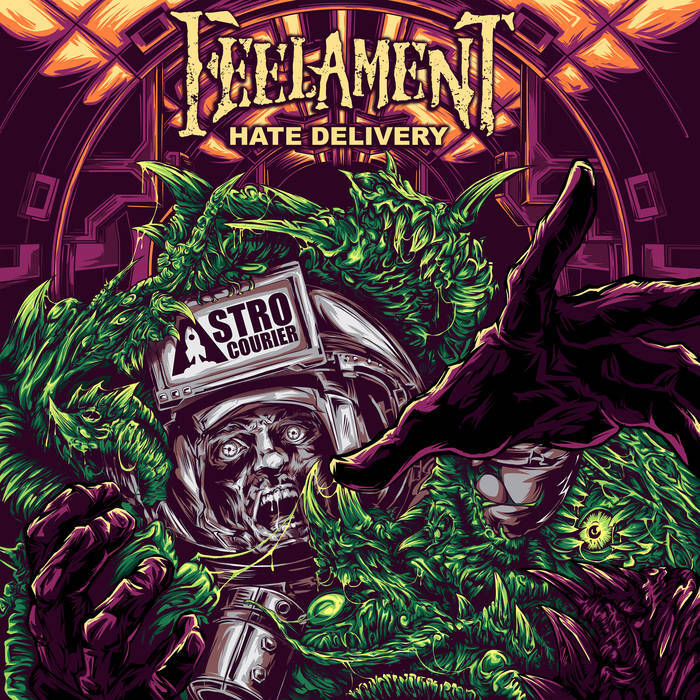 “Hate Delivery” by Feelament is out now!